This is one of those weird moments where the news cycle implodes on itself. The fallout of the United Kingdom's Brexit vote has been on the minds of voters on both sides of the Atlantic. What does it mean when a nationalistic, xenophobic campaign wins? Well the former head of the United Kingdom Independence Party is crossing the pond to tell Americans how we can replicate his country's success. That's right. Nigel Farage is set to attend the Republican National Convention, and he says he has lessons for the United States. They may not be the kind that many want to hear — at least outside of Trump's small circle of anti-immigrant extremists. But he has chosen his audience aptly, by flying to Cleveland in July. He didn't say who invited him to the convention, other than to specify that it was not the presumptive Republican nominee, Donald Trump. 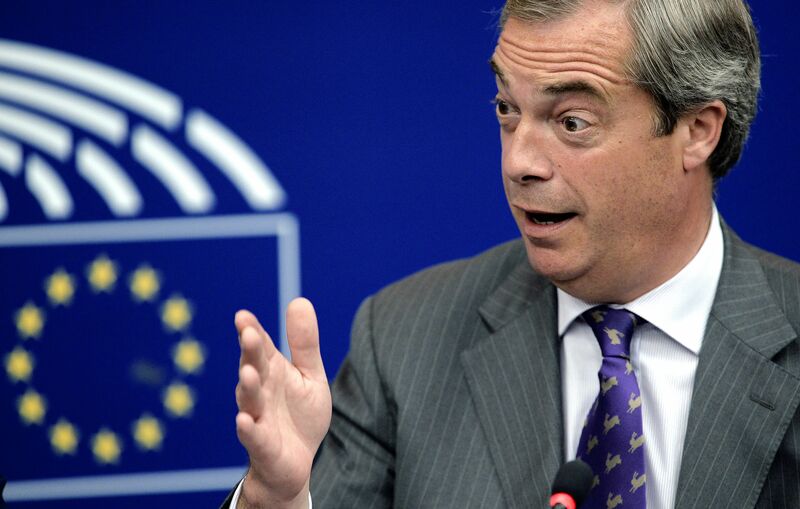 Farage was the leader of the UKIP party until the United Kingdom voted to leave the European Union in June. He said he had achieved his political goals and will be sitting back and watching the Conservative Party carry out the planned exit. The aftershocks of the Brexit vote have rocked the United Kingdom, sending the country's currency into record-breaking lows against the dollar. Political uncertainty has also reigned. David Cameron stepped down as prime minister and was replaced by Theresa May. Farage said he won't endorse any candidates, being as how Obama interfered in Britain's domestic politics when he announced the UK would be at the back of the line for any free-trade agreement with the United States since we were already busy negotiating one with the EU. But if he were to endorse someone, it's pretty clear who that would be. "But I do know a lot of people in the Republican Party, and I'll be interested to hear what Donald Trump has to say in his big speech," he told USA Today. He's said in the past he would never vote for Hillary Clinton. "There is nothing on Earth that could persuade me ever to vote for Hillary Clinton," he told CNN's Richard Quest in June. "I mean she represents the pinnacle elite. It’s almost as if she feels she has this sort of divine right to have that job," he added when pressed. As for a Trump presidency, "I think for the United Kingdom, I think Trump will be better for us than Barack Obama's been. Of that, there is no doubt," he said. For the United States' sake, lets hope his Brexit lessons don't mesh with swing voters this November. The many problems of Brexit probably won't be part of Farage's sales pitch in Cleveland, but they should be on the minds of anyone looking to follow this guy's advice — and that goes for Trump, too.